In August 1990, Iraqi troops invaded Kuwait, a small, oil-rich monarchy along the Persian Gulf. The act was widely condemned, and the United Nations approved military action against Iraq. In early 1991, the United States military led an effort that quickly expelled Iraqi forces from Kuwait; fighting continued into Iraq, whose military suffered tremendous losses. After the war in 1991 and under the authorization of the U.N and with american help, Kuwait began building a fence 190 km long. (The entire border measures about 218km.) Its stated purpose was to stop a re-invasion of Kuwait by Iraq. The border barrier, made of electrified fencing and concertina wire, is braced by a 4.6 m -wide and 15 4.6 m-deep trench, complete with a 10- 3.0 m -high dirt berm and guarded by hundreds of soldiers, several patrol boats, and helicopters. A decade later, it was not Iraq but the United States that wanted to cross the border. 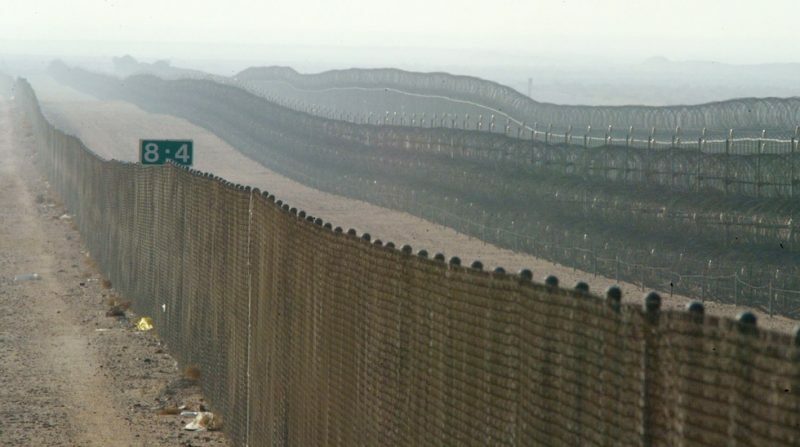 In March 2003, U.N. observers discovered holes in the border fence; Kuwaiti workers, apparently under instruction by the U.S. military, had cut holes in the border fence that were large enough for military vehicles to pass through. The U.N. also witnessed U.S. military activity in the demilitarized zone. Days later, the U.S.-led coalition invaded Iraq. In January 2004, Kuwait decided to install a new 217 km iron border barrier along the existing border. The stated needs were protecting the northern border, and preventing cars coming from Iraq from approaching the electricity bars. The barrier costed an estimated 28 million dollars and will extend until the joint border triangle where Saudi Arabia, Iraq, and Kuwait meet. Asphalted roads will be also constructed to facilitate border security movement.